The Accommodation Fair is a free annual housing event for current and prospective students looking for accommodation in the private sector. It attracts a wide range of exhibitors from letting agents to private halls of residence and a utility bill-splitting company, who are all available on the day to provide you with a host of information on private sector accommodation. The 2018 Fair took place on 19th February 2018 from 11am-3pm at the main University Campus, Level 4 Northampton Suite. The 2017 Accommodation Fair took place on Friday 10th February from 11am-3pm. We had 26 stalls, all providing information on private housing including private halls of residence and letting agents. 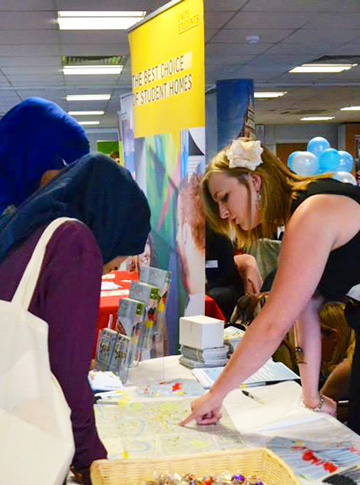 The fair attracted over 450 students who had the opportunity to speak to more than 20 housing providers. said they would recommend the Accommodation Fair to a friend. through posters and leaflets, from friends, or by email from the Accommodation Team. said the range of exhibitors were Excellent/Good.